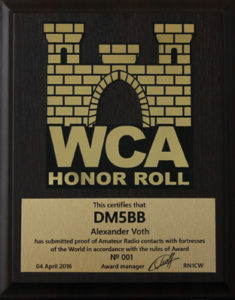 WCA HONOR ROLL PLATE is issued for QSO/SWL with 1001 any objects located in any 10 countries and on any 3 continents of the world. – for the others – 45 EURO (or equivalent in USD). Please ask the Award manager (Andrew RN1CW) about payment details at the moment of application.